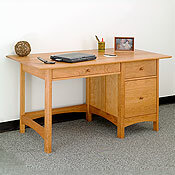 New England Wood Chatham desks for the home office. Choice of solid cherry, maple or walnut wood. 30'H x 54'W x 30'D. Hand-crafted with high quality, solid cherry, maple or walnut hardwood and hand-rubbed with linseed oil finish. Nothing matches the modern-day function, beauty and casual sophistication with our New England Wood Chatham desks. The genuine solid wood and hand-made craftsmanship used throughout presents the look and feel like a cherished family heirloom and will remain a treasured part of your life for years to come. Traditional techniques, such as the use of mortise and tenon joints, combined with an elegant modern design and its rounded lines on the edges express a modern yet confident look. In addition, the solid wood frame and panel side construction sets these desks apart from standard slab-sided furniture. Choose between cherry, maple or walnut wood. Complete instructions along with ongoing care are provided with the furniture at time of purchase. It is suggested that you avoid tung oil and do not use furniture polish, dusting sprays that include a polish, or any wax. Shortly after the desk is placed in your home, re-oiling is recommended, and periodically after that. New England Wood elegant office furniture sets are bench-crafted with the caring techniques of experienced craftsmen and the greatest attention to quality control. This begins with the careful selection of wood that matches in color and grain. These desks are securely joined together with mortise and tenon joints to gain the superior strength and flexibility of movement allowed when one block of wood is inserted into another. Traditional solid wood drawers, dovetail construction and smooth steel glides for durability is a choice that will result in the most durable, long-lasting furniture. Style: Large desk with 1 file drawer and 1 top drawer—pullout keyboard tray which has a drop-down front is an optional add-on. Features unique floating side panels on the sides and front of the desk.